The good Lord has blessed the Body of Christ with more than adequate resources to complete the Great Commission. The problem is that these resources are not properly administrated. Let’s put some facts behind these assertions. Each January the International Bulletin of Missionary Research published statistics about Christianity in its global context. http://www.internationalbulletin.org This January the IBMR reported that the personal income of Christians in 2013 is estimated to be over 33 trillion dollars. 594 Billion dollars (a paltry 1.8% of personal income) were given to all Christian causes. Ecclesiastical Crime (embezzlement and misappropriation of funds for personal gain) cost 37 billion dollars while 33 billion dollars were allocated for World Mission. 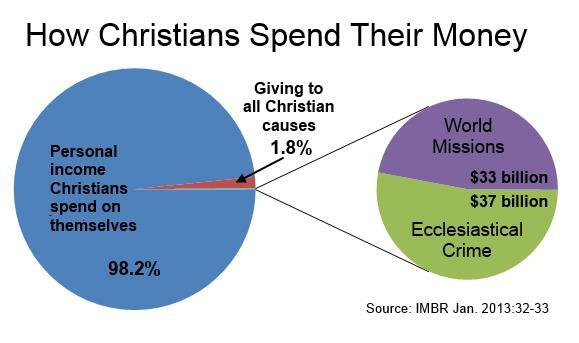 More money is embezzled from Christian causes than is spent on World Mission. A bit more than a half of a penny out of every dollar of Christian giving goes to world missions (0.575 cents to be exact). In light of these facts, could it be that Christians have lost sight of the basic principles of Christian stewardship? Here are the chief ideas that frame my thinking about Christian stewardship. As I talk with missionaries, pastors and leaders of Christian organizations, I’ve heard numerous times that the global economic downturn of 2008 has hurt donations to Christian work. But maybe our problem with funding the Great Commission is not a financial crisis, but a discipleship crisis. Recognizing that globally Christians spend 98.2% of their income on themselves should first shock us to consider whether our own spending priorities are in line with Jesus’s words in the Sermon on the Mount. Funding the Great Commission really comes back to basic Christian discipleship. Teaching people how to live their lives under the Lordship of Jesus would result in re-aligning priorities and re-allocating resources to finish the task. And this would result not only release the necessary funds, but – more importantly – would mobilize prayer, raise up workers (Luke 10:2) and bring the spiritual power (Acts 1:8) needed to complete the task. At its root, we don’t have a financial crisis, we have a discipleship crisis. And that’s why the Great Commission remains unfulfilled. But by focusing on making disciples, all the other necessities for fulfilling the Great Commission will be provided as well. This entry was posted in mission information and tagged Christian, Ecclesiastical Crime, Great Commission, International Bulletin of Missionary Research, Stewardship by russmitchell. Bookmark the permalink. I would like permission to share this on my blog. Great info! Something I have believed but didn’t have the numbers to back up my mouth. not our own kingdoms and personal.. whats in it for me and my hose mentality. may i download.. or could you forward to my email. tntrading@telkomsa.net. Pastor. Greg. Mesias…REfuge P.H.C. Cape Town. fellow worker in and for the kingdom..keep on doing as God requires.Shalom.